Your skin is under attack. Every single day. UV rays, pollution, a poor diet and smoking all send their armies of free radicals to wreak havoc on your skin and give you wrinkles and dark spots. How can you defend yourself against them? Antioxidants. These little soldiers incessantly patrol your body every day looking for free radicals to destroy. But which one to choose? You’ve probably heard that vitamin C + vitamin E + ferulic acid (CEF) is the way to go. I totally agree with that. That’s an essential weapon in any anti-aging arsenal. But, on its own, it’s not enough. The sad truth is that every antioxidant can kill only one or two types of free radicals (ferulic acid kills three because it’s awesome like that). So, the more antioxidants you add into your skincare routine, the better. 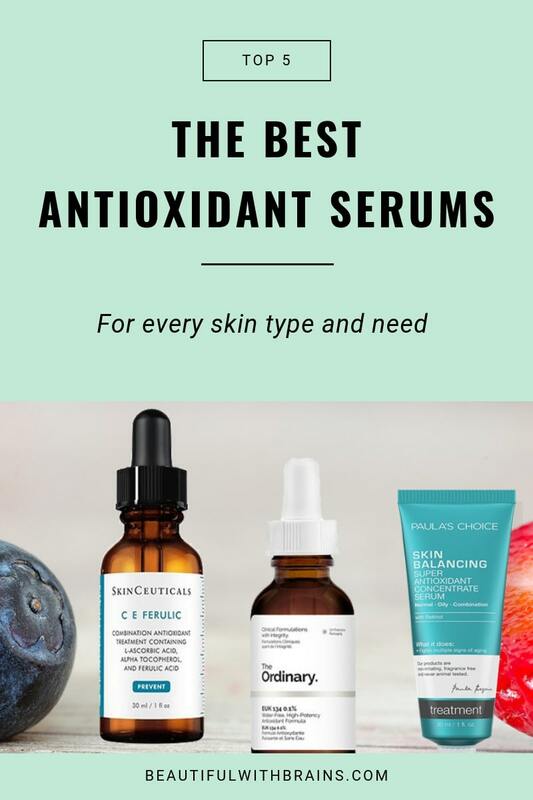 But, just to be clear, you don’t need to get all your antioxidants fix from one serum. If you want to keep your routine short, you can pick a hydrating serum and supplement with a moisturiser or toner full of antioxidants. Skinceuticals CE Ferulic ($153.00) is one of the few outrageously expensive skincare products I’m happy to splurge on. It was the first serum to come out with CEF: it has 15% L-Ascorbic Acid (Vitamin C), 1% Alpha-Tocopherol (Vitamin E) and Ferulic Acid. They’re all powerful antioxidants on their own but together, they’re unstoppable. Studies show they boost collagen production, fight free radicals and enhance the sun protection of your sunscreen. Did I mention it brightens skin and fades away dark spots too? With its lightweight, non-greasy texture, Paula’s Choice Skin Balancing Super Antioxidant Concentrate Serum With Retinol is ideal for oily and combo skin. Plus, it’s loaded with antioxidants to the brim: it has tetrahexyldecyl ascorbate (a form of Vitamin C that penetrates skin more deeply than L-Ascorbic Acid – the one in Skinceuticals) , vitamin E, green tea and grape seed extract (to name a few!). But the star ingredients are Retinyl Palmitate and Retinol, two forms of retinoids that can really reduce wrinkles. Related: Is Tetrahexyldecyl Ascorbate The Best Form Of Vitamin C? The formula is similar to that of the Skin Balancing Super Antioxidant Concentrate Serum, so I’ll be brief. Paula’s Choice Skin Recovery Super Antioxidant Concentrate Serum With Retinol is just as loaded with antioxidants BUT it has less retinoids and MORE soothing ingredients to calm down redness and irritation. With this little tweaks, Paula’s Choice has created a formula that’s as beneficial but less irritating for dry skin. Ok, FarmHouse Fresh Wine Down Overnight Super Antioxidant Recovery Serum has just a drop of fragrance but hear me out. Not only it’s full of antioxidants but it also has its fair share of soothing agents – like chamomile and green tea – to calm down irritations and redness. Plus, they use some of the proceedings to support organisations that rescue abused animals. Don’t you wish more brands did that? The Ordinary EUK 134 0.1% is an anomaly. It has only ONE antioxidant. But that tiny little molecule packs a punch. EUK 134 is a mimetic of superoxide dismutase and catalase, a fancy way to call an antioxidants that destroys hydrogen peroxide (the worst type of free radical). Plus, it’s self-regenerating. While other antioxidants die after destroying a free radical, EUK 134 survives to destroy more little buggers. The problem? Very few antioxidant serums use it. That’s why I recommend you supplement one of the antioxidants serum above with this (just don’t use it with Vitamin C – that completely destroys it!). Related: Is Superoxide Dismutase The Most Powerful Antioxidant Of Them All? What do you think are the best antioxidant serums? Share your picks in the comments below. Ohh yes I always hear such good things about the Skinceuticals serums! Love that you did an ingredient breakdown for each of these and YES antioxidants are amazing for your skin. Jonatan, you’re welcome. That is very generous of you, thank you! I will you email you now. Love your blog and how you carefully and understandably review products and cover all price ranges. Thank you! I am 57 and still trying to figure out what to use and what not to-so much info out there and so many companies trying to play into our insecurities. I look forward to reading more of your blog! I know you are young but please keep us older women in mind! Maureen, thank you, I’m glad you enjoy my blog. There is so much misinformation out there, unfortunately. It’s appalling the way companies are allowed to pray on people’s insecurities, rather than just focusing on creating products that really work. Really loving your website! I wanted to ask you a quick question, after reading a few of your articles. I’m 30 and my skin has always been oily, I get acne if I don’t look after it. A little sensitive too, it gets marks very easily. Last year I got dark spots or melisma in the area above my cheeks/underneath my eyes. I want to get rid of it (as much as possible at least!) but also prevent it from happening again. I also have some wrinkles due a medication I was on years ago. Skinceutical’s C E Ferulic looks great but expensive! I’ve seen you also recommend Timeless 20% Vit C + E Ferulic so I was thinking of trying it. I would then perhaps buy a retinol cream separately, do you have any recommendations? Or would it be better to buy Paula’s Choice Skin Balancing Super Antioxidant Serum that you mention in this article? I feel like buying the Timeless + a separate retinol product might be better but I’m no expert! Thanks Gio, I’m going to give it a go! Fran, that’s a wonderful dupe. It has the same combination of vitamin C, vitamin E and ferulic acid but with plenty more antioxidants! Came across your blog while researching facial products. Your site is wonderfully written, informative and understandable. Thank you, thank you for the product recommendations and prices. Thanks also for addressing the needs of all skin types. Been using Paula’s Choice balanced foaming cleanser & 2% BHA liquid but still have clogged pores so use PC oil reducing cleanser in summer to reduce shine and Resist super light daily wrinkle defense w/ SPF 30. Had microdemablasion for the first time as I’m still not happy w/ how my skin looks. Should I add a retinol product or go all in and get a glycolic peel? Many thanks. Serena, thank you so much for your kind words. So glad you find my blog useful. I’d definitely try with retinol first. Glycolic acid is more for hyperpigmentation and collagen boosting so won’t help much in your case. But if even the retinol won’t work, you can try a salicylic acid peel. I always am interested in your posts. I was introduced to Skinactives antioxidant serum onyour blog and I love it- great value! But I have to disagree with your pick for sensitive skin. The Farmhouse Fresh serum might be great for someone without sensitive skin but seems like a poor choice for sensitive skin, even w it’s soothing ingredients. As someone who struggled with sensitive skin for 20+ years, I’m always disappointed when a product w fragrance (natural or synthetic) or essential oils is recommended for or marketed to sensitive skin. Even “a drop” of fragrance can keep my skin at a low level of inflammation and sensitized to ingredients that I otherwise tolerate well. Everyone’s skin is different and can be sensitive in different ways. But fragrance is a common irritant and has no skincare benefit to balance the risk. Anyone who has noticed skin sensitivity should seriously assess if fragrance is contributing to their condition. Ironically, the recommendations in the other categories all seem more appropriate for someone with sensitive skin as long as they don’t have a particular intolerance to one of the ingredients (like retinol) or the higher levels of actives (like the vitamin c). Well, that’s my sensitive skin rant … Thanks for all the work you put into your blog. Hi Meg, thanks for sharing your experience. I hear ya! Sensitive skin can be irritating so easily and it’s always best to avoid any form of fragrance at all if you can. However, I’ve recently talked to a couple of dermatologists who add just the smallest drop of fragrance in their lines just to mask the natural odour of the ingredients and said that, from the tests they carried out, even their patients with sensitive skin were able to tolerate it. But again, I guess it depends on just how sensitive your sensitive skin is so by all means, check the other options if they agree with your skin better. Hey your blog is absolutely wonderful and informative. I get so much out of it. I had a question about the post above. You mention that EUK 134 is great to use with the serums above. Great, however you also mention that it’s best not to mix with vitamin C but the skinceuticals CEF formula has vitamin c in it. Should that one (or the Paula C15 version) be avoided with it? Is it best to use one at night and one in the morning then? I use the ordinary buffet before all of this in general. Thanks again. I’m serious when I say I trust your blog and find it amazing! CanadianinLondon, oops, should have amended that to say use it with all the serums above but Skinceuticals! Sorry for the confusion! Yes, if you want to use both serums (Skinceuticals/Paula’s Choice) and EUK, I’d use vitamin C in the morning and EUK at night. I’ve learnt so much from you, Gio. And I’ve started to understand better what skincare works effectively on my skin —aging skin which tends to be oily with breakouts?? Vivien, thank you for your kind words. 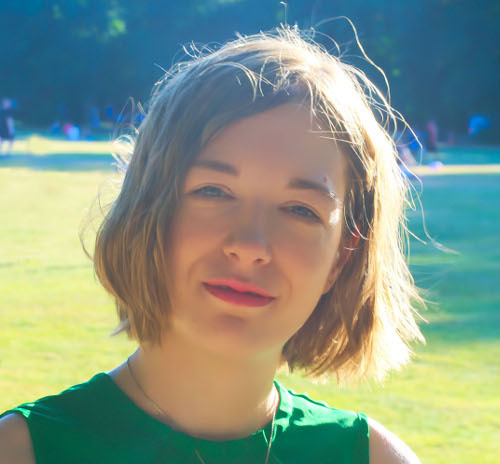 So glad to hear my blog is helping you give your skin what it needs. Vana, it’s ok to use serum alone if you have oily skin. Other skin types will probably need a moisturiser too.